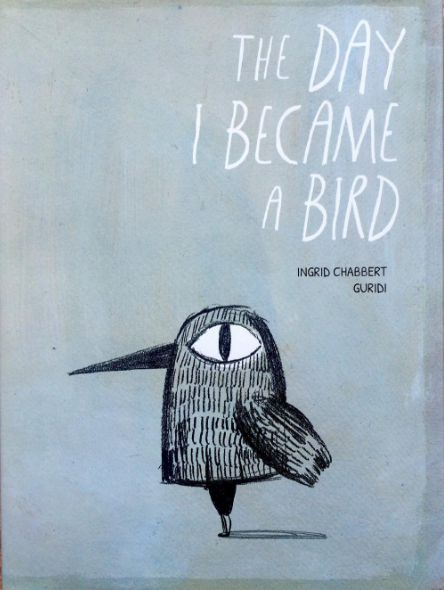 In the two short days that I've had Ingrid Chabbert's and Guridi's The Day I Became a Bird I've read it four times: once before bed, once to my cat, and twice to myself. 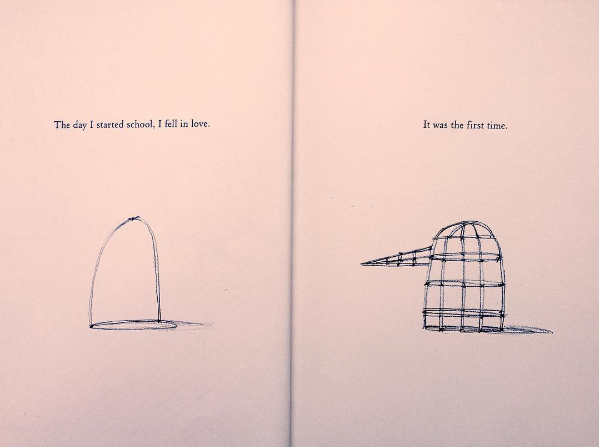 It is the first day of school, and a boy falls in love for the first time. The only problem is that the girl of his dreams, Sylvia, only has eyes for birds. The boy takes the natural next step and constructs a giant bird costume, but will it be enough to catch Sylvia's attention? 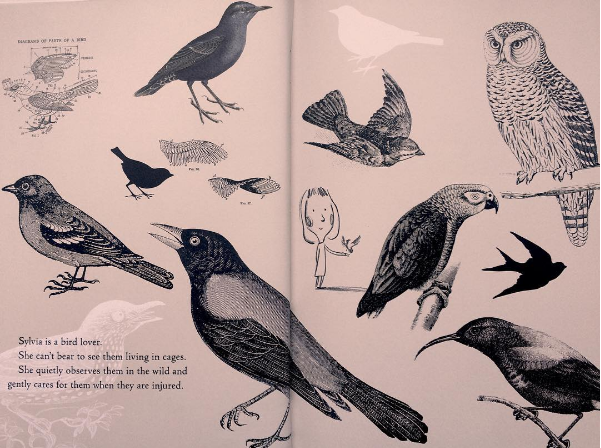 While I find that I often connect more with picture book illustrations than text, the two balance each other out so perfectly in this book. The cadence of the text is immaculately paralleled in Guridi's illustrations, and the pencil illustrations are sparse and loose, almost as though pulled directly from his sketchbook. With the boy's claim that all he sees is Sylvia, it's fascinating that we as readers don't actually see her until the fourth spread. And we don't see the boy himself until the sixth spread. That's pretty far into the story. Instead we witness the construction of the boy's bird costume--what he hopes will be the object of her affection--as the introduction to the story. The boy is so hyper-focused on the one thing that he thinks will connect with Sylvia that he essentially forces readers to be just as single-minded: our only visual introduction into the story is the boy's construction of the costume. It's one of the most open and honest picture books I've ever read: the boy is so certain of his feelings for Sylvia and unabashedly puts his own life on hold to get her attention. It's a love story for all ages and proof that actions speak louder than words. It's an absolute pleasure and honor to add it to my library. The Day I Became a Bird publishes September 6, 2016 from Kids Can Press!